Tagline: Women want him for his wit. The C.I.A. wants him for his body. All Nick wants is his molecules back. In the early 90s, John Carpenter, after a break from filmmaking following the commercial ambivalence indie productions Prince of Darkness and They Live were met with in cinemas, decided to take a punt on directing a studio flick again. The film, Carpenter’s first studio effort since the mid-eighties, was a mainstream Hollywood movie, produced by Chevy Chase, which the actor was using to springboard into drama. Chase wanted the film to have a solemn flavour. So he brought in gun-for-hire John Carpenter to direct, who was hired in the wake of Ivan Reitman, who reportedly disagreed with Chase on what the tone of the film should be. Reitman had left the project after a stand-off with the film’s star ended in Chase’s favour. Warner decided to keep Chase, who wanted to make a serious film about invisibility, whilst the man responsible for directing some of the funniest and most successful films of the eighties was jettisoned to clear a path. After a series of script revisions and personnel changes the film, based on the H.F. Saint book released in 1987, was finally released in early 1992. Kicking off, literally in bubblegum-noir fashion, with Chase’s invisible man chewing gum to prove he’s invisible and talking directly to the camera to lay a few plot foundations, the film jumps back in time so that Chase can recount, often via a pseudo-noir voiceover as cumbersome as the narrative, the events that led to him becoming invisible in the first place. When you can’t remember the night before. Chase stars as yuppie hangover and trench coat aficionado Nick Halloway, the apotheosis of nobody special, a stock analyst who has a better relationship with his bookie than anyone real. During a night out at his favourite watering hole, Halloway is introduced to Alice Monroe, played by Daryl Hannah. Following a brief encounter in the club facilities, the newly acquainted couple agree to meet up again for a dinner date a few days later. Halloway never makes that date though. During a mildly hungover work excursion to low-budget sci-fi corporation Magnascopic, he accidentally causes a nerdy tech assistant to spill coffee onto a computer terminal. Subsequently an impressive indoor firework display ensues, prompting the immediate evacuation of everyone in the building. Halloway, who has snuck off for a lie down, fails to leave the building on time. The edifice explodes and when he wakes up he has been rendered invisible, along with large chunks of the building’s interior. Dali would never be allowed near a building again. As a result of his newly acquired ability, or disability, depending how you interpret the movie, he winds up on the run, the subject of intense government interest, sought after by a shady CIA agency fronted by Sam Neil’s comic book villain David Jenkins. In a bid to ditch the zany persona he had contrived during his tenure at Saturday Night Live and subsequently during his 80s screen heyday, Chase plays Halloway as straight-up middle management. However, rather than a Cary Grant styled rendering of grace under pressure, as epitomised by Grant’s performance in North by Northwest, Chase’s performance is irritatingly monotone. Similarly, Daryl Hannah’s performance as love interest Alice is rendered inert by the narrative’s lack of urgency. With a lot of screen time given to Nick wandering the streets aimlessly and hiding out in his old drinking haunts, whilst struggling to adapt, one wonders if this might have been time better spent paying the central romance of the movie more attention, since when it eventually does develop ahead of steam, it is immediately subsumed by the film’s overarching thriller requirements. Try not to get too excited, but I think you’re finally due to land that best actress Oscar. Though there may be parallels between Jeff Bridges’ character in Starman and the invisible man in ‘Memoirs’, ultimately, this is a film-for-cash venture, something Carpenter acknowledged from the moment it was released. His name, for example, is not attached to the title at the start of the film. In a bid to explicate this, Carpenter indicated Warner Bros would never have allowed him to make the film he wanted, stating they were “in the business of making audience-friendly, non-challenging movies”, hence the reason his name was not included. Carpenter’s direction is workmanlike and lacks the creative cool and visual surety of his back catalogue up to this point, which is particularly odd given the film was shot by legendary cinematographer William A. Fraker. Carpenter’s moniker is not the only thing absent from the movie. The screenplay is brain-numbingly conventional and tonally dysfunctional. William Goldman, legendary writer of The Princess Bride and Butch Cassidy and the Sundance Kid, completed a number of script versions prior to departing the project. As with Reitman, the rationale was that the producers wanted to make a serious movie about how lonely it is when you’re invisible. Goldman cannily left the production, taking his intelligence and comedic chops with him when he absconded for alternative pastures. Okay, now do you believe I’ve not been drinking? Due to Chase’s insistence on a serious movie to promote a jump to more serious roles, the humour was squeezed out of the flick in a series of redrafts. Though the film retains some notably comedic moments, Nick vomiting and Nick attempting to get his coat providing two such examples, what is left once the humour has been rinsed is a bland personality vehicle lacking dramatic tension. Despite Chase’s hope that the film would provide a meditation on the issues of loneliness and isolation, it winds up a tangled mess of unexplored themes whose fractured personality never fully coheres. 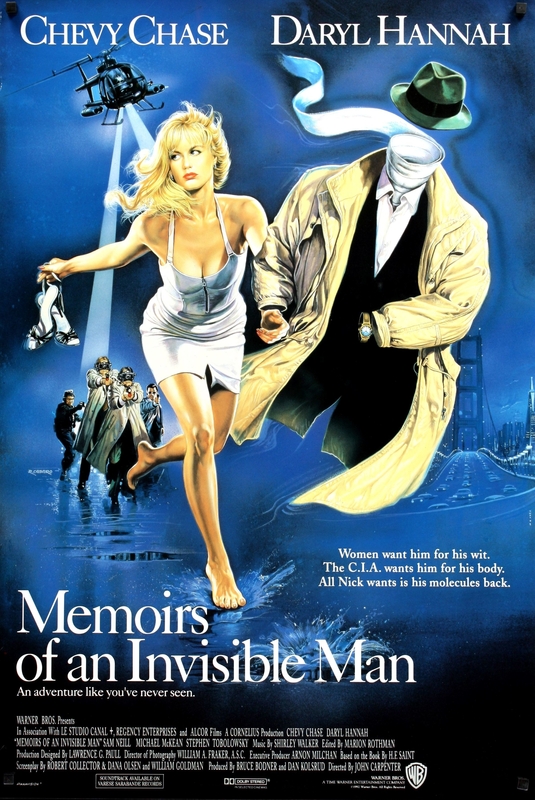 Ultimately, Memoirs of An Invisible Man is all surface no feeling. There are some well-played references to James Whale’s superior The Invisible Man, a clutch of Alfred Hitchcock movies (North By Northwest being the most obvious) and a slew of cheapo noirs. However, despite the fact it was one of the first movies to feature a full orchestral score composed by a woman (Shirley Walker), and despite remaining an impressive showcase for the creative visual talents at Industrial Light and Magic, (whose effects work on the film were groundbreaking and still hold up to scrutiny even in today’s CGI saturated climate,) what ought to have been a frothy, funny, fantastical romance with cool effects and suspenseful plotting is an emotionally blunted, sporadically entertaining, narratively unadventurous low-key trudge. The label of his shirt was kinda itchy. Upon its release, the film would do very little business at the box office, generating lukewarm reviews, mostly due to the exciting effects work on display. In retrospect, it can be seen as a marker for the final resting place of Carpenter’s bid for commercial success. 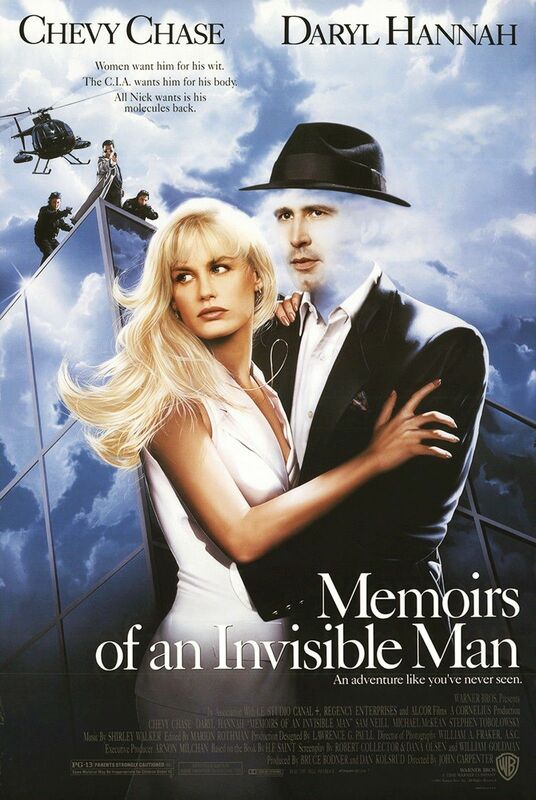 Chase’s screen career, meanwhile, and also the screen career of Daryl Hannah, who would go on to star in the Attack of the 50ft Woman remake a year later before sliding into acting limbo for close on a decade, never fully recovered in the wake of its release. Kills are limited. It’s not that kind of movie. Sam Neil’s villain meets a bad end when he makes a lunge for Nick’s coat on top of a high building only to discover Nick isn’t inside it. He subsequently plunges off the top of the building. Suffice it to say, it’s high and he lacks the aerial capabilities to prevent him from dying. Nick dreams Freudian horror dreams of a potential sexual encounter with scantily clad Alice. However, much to his distress, when he opens up his dressing gown to reveal himself, his manhood has been erased and the pattern on the back of his dressing gown is clearly visible in its stead. It’s all rather stilted, but as with any Carpenter talkie, there are some choice interactions to be had amidst the dross. Addressing a senior colleague, Sam Neil, as the villain of the piece, has this to say about How Things Work! For John Carpenter completists and folks interested in the evolution of CG in cinema, Memoirs is definitely worth investigating. For everyone else, however, it is entirely forgettable. Pleasantly diverting in its better moments and sleep-inducing in others, it may not be the worst John Carpenter movie ever released but it is without a shadow of a doubt his most indifferent work.